Is the Yosemite View Lodge Haunted? 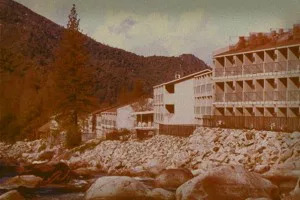 One of Yosemite’s most haunted locations is the Yosemite View Lodge in El Portal, California. 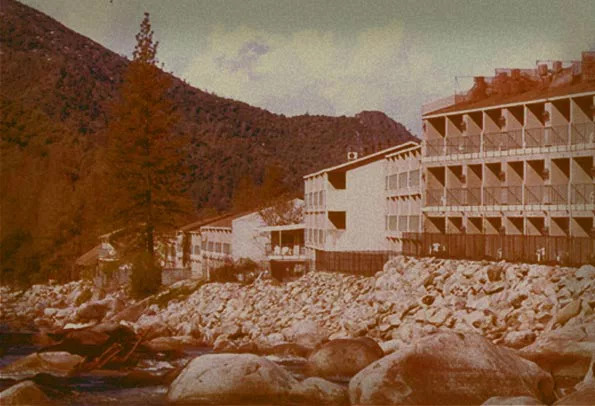 The rustic hotel sits at the edge of the Merced River, near the entrance to the park where guests have reported a real haunt and ghostly happenings. The Lodge on the Merced River is in a peaceful setting, but looks can be deceiving. One guest at the Yosemite View Lodge was traveling with a friend. Their first night at the lodge was quiet, and they weren’t prepared for what happened the second night. One of the guests awoke in a terrified state after seeing a shadow person standing near the bed. The figure had no discernible features, didn’t speak, and appeared to be approximately five feet tall. The guest was so horrified that she called to her friend to witness the apparition. She wasn’t able to sleep for over an hour after the encounter. She referred to the apparition as one of the river people because she wondered if it was a native spirit and felt that the river may have been responsible for the phenomenon. The guest possesses psychic abilities, but it’s unusual for her to see spirits. When doing an internet search, the psychic found that other people have had similar experiences. Shadow people have appeared numerous times in guest rooms at the lodge. 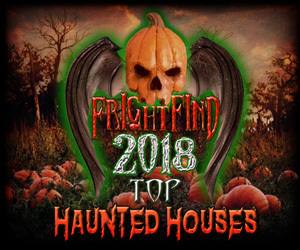 Most of the guests aren’t aware of the hotel’s haunted reputation and aren’t provoking the spirits. The apparitions usually disappear when they realize that guests are aware of their presence. On an April day, three friends checked into the lodge. When they entered their room, two of the guests felt a presence that was most powerful in the bathroom. During the night one of the guests awoke to see a shadowy apparition standing at the foot of the bed. Upon checking, found that both of her friends were asleep. 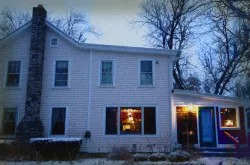 When the friends talked in the morning, one of the trio reported seeing a shadow person standing near the fireplace. All three feel that the hotel is haunted and get chills thinking about their experience. One woman has stayed at the lodge with her family on four occasions. One night she heard someone walking around the room, but her husband and daughter were asleep. She had similar experiences in other rooms at the lodge. One night she was tapped on the shoulder. Thinking it was her daughter, she checked to find her sleeping peacefully. She had the sensation that there was a presence in the room and remained awake all night. In the morning, she did an Internet search and found that several guests had similar experiences. Even though the family planned to stay another night, they packed and left the hotel. 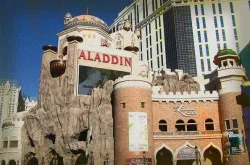 One family from Australia was unaware of the haunted reputation of the hotel. The first night, the six-year old daughter complained that someone was pinching her. No one was near her. During the night, a man described as creepy knocked on their door and said he was looking for someone. Later, the husband opened their door and saw the man down the hall staring at their door. Was he a ghost? His wife had the sensation that there was a spirit in their room. During the night, a loud crash woke them. One of their bags that had been in the center of the table was across the room. 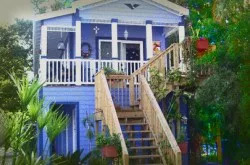 After their experience, the woman Googled the hotel and learned that numerous guests have had similar experiences at the haunted hotel. I had stayed in a room at the Yosemite View Lodge this past April with my boyfriend and another friend of ours. Immediately upon entering the room I felt the sensation of being surrounded by a presence (in particular in the bathroom), and put friend felt the same. During the night, I saw a shadowy figure at the foot of our friend’s bed and assumed it was my boyfriend, although as I turned in bed I saw my boyfriend was still laying next to me, asleep. In the morning, our friend reported seeing a shadowy figure near the fireplace during the night. This place is certainly haunted, I still get chills thinking about it! Okay so I’ve stayed at the Yosemite View Lodge about 4 times. The last time we stayed on the bottom level next to the river. All the other times we had stayed on upper floors or in the buildings away from the river. I was there with my husband and daughter. We had 2 beds. I slept with my husband on the bed nearest the sliding glass doors. In the middle of the night I woke up and thought my husband had gotten up and was walking around. I was half asleep and something similar had happened recently in another hotel room where he actually was up in the middle of the night. But when I looked over, he was still in bed. I really didn’t think much about it. After waking up I was facing the wall and sliding glass door. I had a strange feeling that something was over in the area where the table was next to the wall. I have NEVER had these thoughts or feelings before. My family was sleeping away peacefully. The next day I really forgot all about it. I didn’t say anything about it because it could all be attributed to being half asleep and imagination. We went to bed that night and I felt uncomfortable facing the wall so I faced the other way. I woke up when it felt like someone tap me on the shoulder twice. I couldn’t decide if I dreamed it or maybe my daughter had gotten up and was waking me up. I decided not to ignore it when I thought it may be her. I turned around and no one was there. I couldn’t sleep for the rest of the night. I remember thinking about the possibility that it could be haunted, but I dismissed it as being half asleep and my imagination. The rest of the night I kept getting closer and closer to my husband in bed, who had no idea what was going on. I couldn’t wait for morning. The next morning when he got up I was already awake. I told him that tonight I would absolutely NOT be sleeping by the wall. I told him what happened. I told him as soon as I got internet signal I was going to look up the hotel for paranormal activity. I told him that I bet I would find it. After that we packed up and left early. As soon I got cell phone service I looked it up and sure enough I found that some other people had experienced things too. I stayed at the Yosemite Lodge in 2014 with my family from Australia. I’d never heard anything about the place being haunted. The first evening we were just relaxing in our room. There were 2 double beds. I was on one and my 6 year old daughter was leaning over the other one in a bikini. She then yelled out to me to stop pinching her on the bottom cause it hurt. There was no one even close to her. I told her it wasn’t me cause I was sitting on the bed looking at my phone. She still didn’t believe me and looked upset with me. I had the eeriest feeling then that there could be a ghost in our room. That night we had a creepy guy knocking on our door in the night and my husband answered the door and he said he was looking for someone. My husband later opened the door and the guy was suspiciously looking up at us from downstairs near an ice machine, but his cup was empty. Later that night we were all asleep, when we were awakened by the loudest crashing noise. It was so loud that my husband and I both sat up in bed, wondering what had caused the noise. A bag that was in the “middle of the table” was now on the floor. I couldn’t wait to get out of that hotel! Luckily we’d only booked one night there before moving on. I was just talking to my son about how I thought it was haunted there. 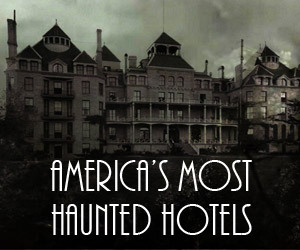 I decided to Google Yosemite haunting because I’d forgotten the name of the hotel. When I did, I saw there have been numerous experiences there and the pictures came up of the hotel and it was definitely Yosemite View Lodge, that I know now for sure!